Brittany, Cameras, film and memory cards, Epic Postcard Moments, food, languages, Travel - bon voyage!, Vive la France! This made me smile. The French are famous for (quite rightly) expecting foreign folk to make at least some small attempt at speaking their language. Most of the time, if you at least TRY to say hello, goodbye or thank you, a French person will try to help you in your own language if they can. But march into any establishment and begin communication with “parlez-vous anglais” and the potential to commune in English may just fly out the window. You see, in the eyes of the proud French, you haven’t even tried to employ their romantic, beautiful tongue, and this may well induce sudden foreign-linguistic amnesia, hence my amusement when I saw this sign. Yes, they speak English here, and it looks like they might enjoy the practice. 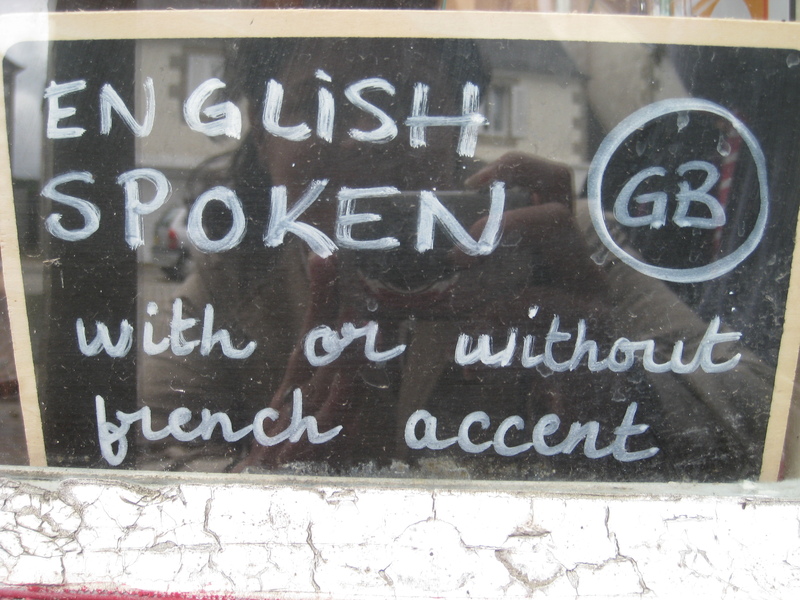 This is one, rare place in France where you won’t have to ask “parlez-vous anglais?”. The first time I went to France, myself and a friend always used our butchered French and usually muddled through. We arrived early in the morning at a hostel in Antibes with a few other people who were on the train. The other people took charge, confronted the staff with “Do you speak English?”, and were quickly ignored. My friend used his best butchered French and we were told where to leave our backpacks and what time to come back to check in. A little bit of some things goes a long way sometimes.